The main trigger for oily skin is Dihydrotestosterone Hormone (DTH) which controls the sebum/oil production in the sebaceous glands. When excess DTH is released by our body, it signals the sebaceous glands to produce more sebum. Few factors that contribute to excess DTH production are fluctuating hormones during puberty, pregnancy or menopause, genetics, a bad diet and stress. Apart from that, factors like hot/humid climate, dehydration, and sun’s damaging rays can lead to oily skin temporarily. Certain prescription drugs and expensive medicated ointments provide only temporary results. But thankfully, there are a number of natural ingredients such as sugar that can be used to reduce the excessive oiliness of skin without drying it out. In this article, let’s talk about how sugar can be an extremely effective natural remedy for oily skin. What Makes Sugar Effective for Oily Skin? Sugar scrubs also have an anti-aging effect on oily skin. It enhances blood circulation and oxygen flow, leading to increased collagen production and smoother, nourished skin. Sugar works as a natural humectant. It locks in just the right amount of moisture and helps to keep skin adequately hydrated without making it too oily. 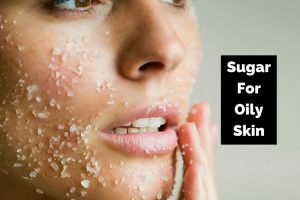 How to Use Sugar for Oily Skin? Below, we specified various sugar remedies for treating oily skin. You can choose any one method among them and try regularly as specified to achieve the results. Note: We recommend washing the affected areas with cool water and mild cleanser before trying any of remedy. It helps to remove the impurities present on the skin and enables a better penetration of the mask. Honey is a natural humectant and anti-oxidant that keeps the skin supple by absorbing excessive oils from the surface of the skin. Mix 1 tablespoon sugar with 1 teaspoon honey in a bowl. Scrub the affected areas with this mixture gently for 2-3 minutes. Use this scrub twice a week. Tomatoes work as natural acidic astringents which shrink the open pores and remove the excess oil from the skin. They are also rich sources of vitamins A and C which helps to keep the skin nourished. Extract the juice from 1 small, ripe tomato in a bowl. Add 2 tablespoons sugar to it. Gently scrub the mixture on oily skin for 3-4 minutes. Rinse off the application with cool water. Note: In case you have extremely sensitive skin, add 3-4 drops of honey to this scrub. Egg white helps to shrink open pores in the skin which can get clogged with excess oil. It also helps to tighten the skin and prevent sagging. Add 1 teaspoon of sugar to the egg white in a bowl and stir well. Apply the mixture on affected areas of the skin. Massage gently in circular motions for 5-8 minutes. Leave it on and allow it to air-dry. Repeat application twice in a week. Bananas contain Vitamin A, B & E, potassium and other nutrients that even out rough and oily skin, keeping it adequately moisturized from within. Mash the pulp of 1 ripe banana in a bowl. Add 2 tablespoons sugar to it and mix well. Make sure the mixture doesn’t have any lumps. Using fingers, apply on oily skin and gently massage for few minutes. Use once every 3 days. Yogurt contains lactic acid, a natural alpha-hydroxy acid that helps to exfoliate oily skin. It helps to strip off the excess oil from clogged pores of the skin. Add 2 tablespoons of sugar into ½ cup fresh yogurt and mix well. Scrub on oily skin gently with circular motions. Use on alternate days for a fortnight. Baking soda works as a mild exfoliant to help remove dead skin cells and cleans up clogged pores. Its astringent property prevents infections on oily skin by shrinking the open pores. Combine 2 tablespoons of baking soda and water to make a paste. Massage for 5 minutes on affected areas of your skin. Repeat thrice a week for best results. Aloe vera works as a soothing natural moisturizer for the skin without giving it a greasy or oily feel. It also acts as an astringent to shrink the pores, thus keeping out excess sebum, dirt and infection-causing microbes from oily skin. In a bowl, add 2 tablespoons of aloe vera gel and 1 tablespoon of sugar. Whisk continuously for few minutes. Massage the mixture on affected areas of the skin for 5 minutes. Re-apply 3 times in a week. Orange contains citric acid that acts as a natural astringent which shrinks the open pores. It also exfoliates the dead skin cell, excess oil and impurities present on the skin. Combine 3-4 tablespoons of orange juice and 1 tablespoon of sugar in a bowl. Apply and leave it on for 5 minutes. Use twice in a week. Olive oil helps to dissolve the excess oils present on the surface of the skin. It also moisturizes the skin without clogging the pores. Combine 1 teaspoon of lemon juice, 2 teaspoons sugar and 2-3 drops of olive oil. Massage it gently on your oily skin for 3-4 minutes. Repeat the application once every 3 days. Note: Instead of olive oil, you can add honey to achieve the same results. Orange peel has rich anti-bacterial and anti-microbial properties along with anti-oxidants that help to treat acne caused by oily skin. It is also an astringent and opens up the oil-clogged pores of the skin. Mix 1 teaspoon grated orange peel, 3 cups of sugar and 1/3 cup olive oil in a bowl. Apply and massage on oily skin for 5-8 minutes. This exfoliating scrub removes excess oil from the pores of the skin and helps in regeneration of skin cells. Mix 1 tablespoon of sugar, 1 teaspoon each of honey and olive oil in a bowl. Start massaging it in gentle circular motions from the chin towards the cheeks. Splash face with cold water to close the skin pores. Coconut oil is natural oil which cleanses the skin, unclogs blocked pores and helps maintain the natural oil content of the skin surface. Combine 2 tablespoons of sugar, 1 tablespoon lemon juice, ½ cup of coconut oil to a bowl. Gently scrub over affected areas in circular motions. Leave it on for 5 minutes and wash off with cold water. Repeat 2-3 times in a week. Since they are made up of 90% water, cucumbers moisturize the skin without making it oily. Being a natural astringent and exfoliator, it tightens up the open pores of the skin. Mix ½ cup coarse sugar with ½ cup fine white sugar. Add 2-3 tablespoons of coconut oil and 1 tablespoon cucumber juice to the mixture. Apply the mixture on oily skin. Eucalyptus oil is known for its natural astringent properties that help to regulate the production of sebum, resulting in toned skin. Combine 1 cup sugar, ½ cup coconut oil and 6 drops of eucalyptus essential oil in a bowl. Scrub the mixture in circular motions on the oily areas. Leave on for 8-10 minutes. The kiwi fruit is rich in antioxidants as well as Vitamins A and C, which help in controlling excess sebum production on the skin. Peel and mash 1 kiwi in a bowl. Add 2 teaspoons sugar and 2-3 drops of olive oil to it. Scrub it in circular motions for 2-3 minutes. Leave on for 5-8 minutes. Note: You can also use sunflower oil instead of olive oil in this scrub. Green tea is a natural source of anti-oxidants and catechins, which act as natural astringents for the skin. These help to shrink pores and reduce excess sebum production. Combine 2 tablespoons each of green tea and sugar. Add 4-5 drops of lemon juice to it and mix well. Using a cotton ball, apply it on oily skin. Scrub gently for 3-4 minutes. Rinse with lukewarm water followed by cool water. The remaining green tea solution can be stored in an airtight container for re-use. Repeat the application twice a week. Note: Instead of lemon juice, you can add 2 tablespoons of honey and follow the same process to achieve the results. Almond oil contains fatty acids that dissolve the excess sebum produced by the sebaceous glands. In a bowl, mix 1 tablespoon sugar, 1 tablespoon almond meal (finely ground almonds) and 2 tablespoons almond oil. Scrub the mixture gently on oily skin. Leave it on for 8-10 minutes. Use this application once in a week. In addition to being a rich source of anti-oxidants, coffee is an anti-inflammatory agent that reduces the redness of inflamed, oily skin. Caffeine dehydrates fatty cells in the skin by pulling out excess water from the layers, resulting in smoother skin. Grapeseed oil is a mild natural astringent that helps balance the body’s natural oil production. It seals an adequate amount of moisture in the skin to keep it hydrated. Mix 3 tablespoons ground coffee, 1 tablespoon each of brown sugar and grapeseed oil. Stir out any lumps to make a smooth mixture. Apply it to affected areas of skin. Blueberry helps normalize and maintain adequate levels of oils in the skin and helps to even out the skin tone. It is also a rich source of vitamins and minerals that are essential for the nourishment of healthy skin. Wash and crush ¾ cup of ripe blueberries. Add 1 tablespoon sugar and 2 tablespoons honey to it. Mix well and use as a scrub on oily skin. Rinse skin with cool water. Follow the method once in a week. This chocolate scrub helps to control excessive oil secretion from the sebaceous glands and keeps the skin oil-free. Cocoa powder is rich in anti-oxidants and has anti-inflammatory properties which are crucial for the maintenance of healthy and nourished skin. Vanilla extract is a rich source of many vitamins and minerals which soothes irritated oily skin and improves the overall skin tone. Mix ½ cup cocoa powder, 1 tablespoon vanilla extract, ¾ cup almond oil, ¼ cup brown sugar and white sugar together in a bowl. Rub the paste lightly in circular motions on oily skin. Wait for 5-8 minutes and wash off with cool water. Repeat once a week for a month. Note: This scrub can be stored in an airtight container for later use. But make sure to use it within 2 weeks. Being a good natural absorbent, oatmeal helps to get rid of excess sebum on the skin. It is a natural moisturizer and tricks oily skin into producing lesser oil than usual. It also has a grainy texture which makes it an excellent natural scrub. Grind ½ cup of oats into fine powder. Add ¼ cup brown sugar, 2 tablespoons honey and ½ cup coconut oil to the oats. Apply the scrub on oily skin and leave it on for 5-8 minutes. Peppermint helps to balance the natural oil content of the skin. It provides soothing and cooling effect on oily skin. Combine ½ cup sugar, 1 teaspoon mint juice, 1 teaspoon almond oil and 1-2 drops of peppermint oil to it. Massage for few minutes and rinse off with water. A ginger scrub helps to reduce excess sebum production, eliminate the shine of extra oils on the skin and cleanse up the clogged pores. It also stimulates blood circulation and keeps the skin supple. Cinnamon helps tighten pores and clears it up of blemishes. Nutmeg is an anti-oxidant and anti-inflammatory agent that helps exfoliate dead skin cells. In a large bowl, mix ½ cup white sugar, ½ cup brown sugar, ¼ teaspoon grated ginger, ¼ teaspoon nutmeg, ¼ teaspoon cinnamon, 3 tablespoons almond oil and ¼ cup coconut oil. Massage the mixture on oily skin for 3-5 minutes. Carry out a simple patch test on the inner arm to make sure you’re not sensitive/allergic to any ingredient used in the remedy. If you have extra-sensitive skin, it is better to opt for brown instead of white sugar. Because the granules of brown sugar are softer than the other. In case the skin appears too dry after washing off a scrub, you can apply a light, oil-free, water-based moisturizer on the affected areas. Always apply sunscreen when you are going out in the sun to avoid more damage to your oily skin. Taking a hot shower or steam bath before trying the remedies helps to open up the clogged pores and makes the remedy more effective. After application, gently massage in for a few minutes and avoid harsh strokes. Regular circular motions help the scrub to penetrate into the layers of the skin well. Stay away from any source of heat or direct sunlight after applying a scrub on your skin. Ensure that the scrub does not enter your eyes while application because some ingredients might irritate the conjunctiva leading to watering or redness. A good option is to place cucumber slices on the eyes for soothing purposes. Never use any sugar scrubs on open wounds or cuts on the skin. Allow them to heal fully before application. Following a daily cleansing, toning and moisturizing routine can do wonders for your oily skin. Make sure all your cosmetics are oil-free/water-based. Remove all make-up and cleanse your skin at least twice a day to avoid excessive oil formation. Include protein-rich foods, green leafy vegetables in your diet and stay away from deep-fried food and caffeinated/carbonated drinks. Stay hydrated – drink adequate amounts of water throughout the day to make sure your skin remains healthy and nourished. Did this article help you to find the most suitable natural home remedies for your oily skin? Are there any other natural products you use apart from sugar to combat the problem? Do let us know your ideas, experiences and questions in the comments section below.